All the CSIT-members (unions, teams, athletes, coaches and volunteers) promise to participate in all CSIT activities, respecting and abiding by the rules which govern them, committing themselves to a sport without doping and without drugs, in the true spirit of friendship, solidarity, tolerance and fair play. Fair Play is very important to CSIT. It reflects the real spirit of sports and is actually close to the aims of CSIT. 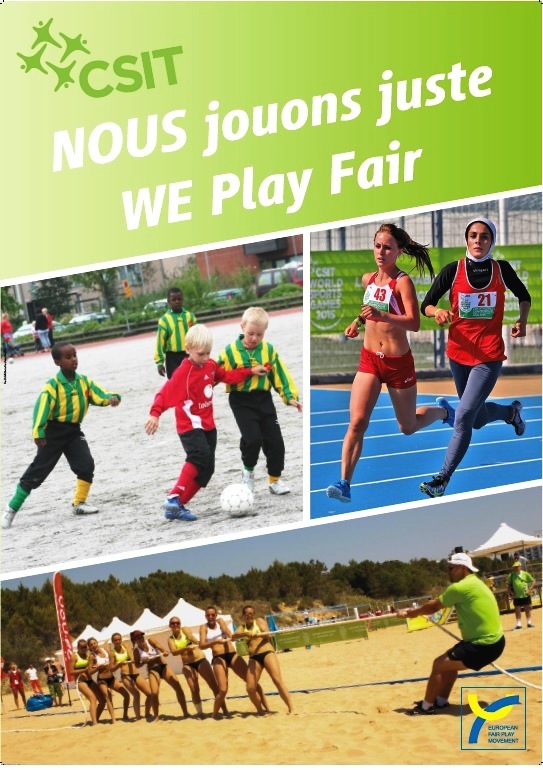 At the World Sports Games of 2017 will be the official launch of the CSIT Fair Play – activities, which are implemented more detailed in the CSIT championships regulations of each sport. 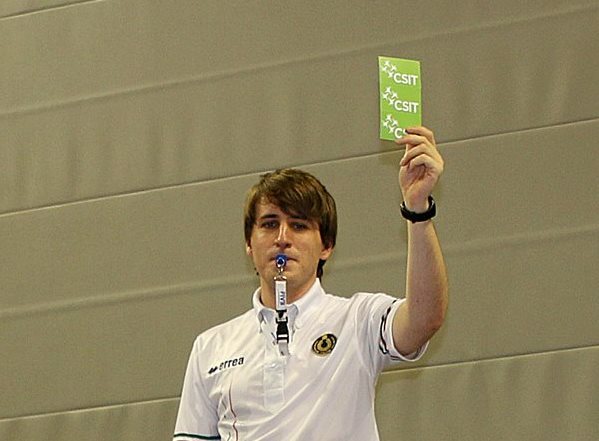 Besides the “Green Card” – visible in competitions and games – the Fair Play subject will also be visual and promoted at hotels, sports venues, websites and brochures. Finally Fair Play will get full attention at the closing ceremony, where teams – male and female athletes – with the highest Fair Play – coefficient will be awarded solemnly. Fair play is a complex concept that comprises and embodies a number of fundamental values that are not only integral to sport, but relevant in everyday life. This philosophy of Fair Play can be learnt and experienced on and off the sports area. 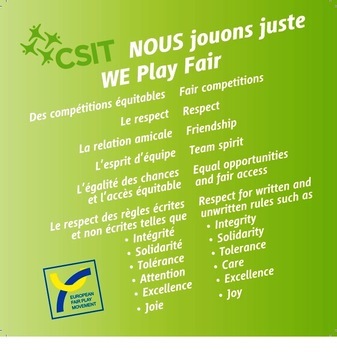 CSIT Fair Play POLICY (long version)! During the board meeting in Tampere 2009 a joint venture declaration between CSIT and the European Fair Play Movement (EFPM) was signed, because the promotion of Fair Play is considered as an important contribution for peace and understanding. The CSIT and the EFPM will try to establish and to coordinate common activities in matters of fair-play, tolerance, peace and understanding. The CSIT and the EFPM will strive, step by step, to have a close cooperation by supporting the aims and goals of both organizations. For example with common activities at the "World Sports Games" of CSIT, with seminars and workshops on several topics of Sports and Fair-Play, etc. The CSIT and the EFPM will enable each other to publish articles and information in their respective official publications, internet pages and papers. The CSIT and the EFPM will nominate a member of its Executive Committees as regular contact persons. These CSIT and EFPM representatives will meet preferably at the General Assemblies and/or Congresses of the two organizations with the possibility of short presentations about each organization and their annual work. The foreseen activities of the CSIT and the EFPM will be discussed at the above mentioned meetings. The EFPM will help the CSIT to sensibilize its members for the importance of the ethical and cultural values of sports. The CSIT will help to promote the strengthening of fair-play, tolerance, peace and understanding through and in sports.